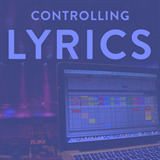 Welcome to the Controlling Lyrics with Ableton Live Course! The goal of the Course is to provide you with everything you need to know to control ProPresenter with Ableton Live. Check out the video above for a brief overview of the Course. You'll find the sources files and templates for each section when you click on that section to view. Download these files to work with the actual files while I'm talking about them. Because of copyright limitations, I can't share the actual samples used in each file. If you purchase the same content, you can load that file into the samples and it will work just like mine. For Example you can purchase the 10,000 Reasons MultiTrack and load it's samples into the 10,000 Reasons source file. It will work just like mine. Take advantage of this ability often! Write notes also so you can come back and reference them as you're learning this concept. The Show Notes are a great way quickly jump to a specific section of the video. If you take a break and need to come back, you can quickly jump to that part. Think of it like a Table of Contents. There's also various links included in the Show Notes so you can follow along as I'm teaching. In order to continue the Discussion we created a private Facebook group for this course. You can find it on Facebook because it's a 'Secret' group. To get access just send an email to support@multitracks.com with the email address associated with your facebook account and we'll add you to the group!